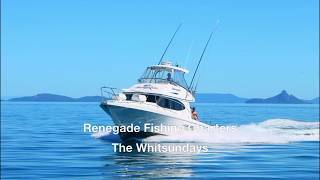 Renegade Fishing Charters are a premium fishing charter experience, located in the Whitsundays. They operate Game, Sport and Reef fishing charters on board their two vessels (38 foot and 34 foot game boats) purpose built for comfortable fishing. Operating from Hamilton Island, Airlie Beach and most other island resorts and offering a professional experience with local guides. They offer half day Private and Shared charters, full day private and shared charters and extended full day private charters for their guests.